Exciting news! I just added Android 6 Marshmallow to Browserling. You can now cross-browser test your websites in Android 6. Browserling is live interactive cross-browser testing service. It lets you get a browser in 5 seconds and test your website in all the most popular browsers, such as Internet Explorers, Firefox, Chrome, Opera, Safari and now Android browsers as well. It's awesome, try it out for free! 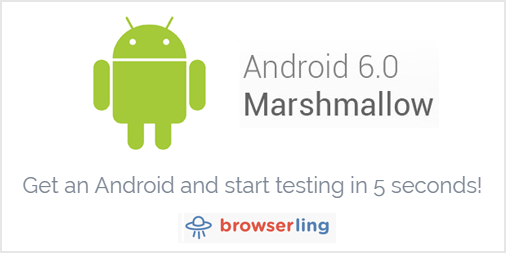 This blog post is a repost of Android 6.0 Marshmallow Now Available from Browserling's cross-browser testing blog.